How The Inhumans Should've Started - Honk if you love justice! The first three episodes of The Inhumans have aired (the fourth is tonight), and they are…not great. I’m no pessimist, and I’ll probably keep watching, but I have a LOT of thoughts on what went wrong, and how it could’ve been fixed. I actually agree with Marvel that The Inhumans shouldn’t be a movie. They already caught lightning in a bottle with Guardians of the Galaxy. Taking a group nobody knows and making them a huge hit may not have worked again. Plus, you’ve already introduced the idea of Inhumans on TV via Agents of SHIELD. Why give up that synergy? It’s one place where Marvel could look to DC for inspiration. A lot of the fun with the DC TV universe right now is how they can intermingle at will. Wally West can pop in on Legends of Tomorrow, Felicity can slide into The Flash. Use that. It seems clear to me that the background strive between Marvel’s TV and movie arm had a huge negative effect on The Inhumans. What we ended up with was a movie-length story stretched to fit 8 TV episodes. We have no reason to care about the Royal Family. You can’t even tell whether or not Maximus is in the wrong. That might work as an action movie where you just keep up a breakneck pace, but for 8 TV hours, nope. If it were me, I would’ve gone ahead and made this part of Agents of SHIELD. They had some great success with story arcs last season, and that could’ve worked well here. You can even start building things the same way. Triton comes to Earth to rescue an Inhuman, but instead of finding some babe in the woods, it’s Daisy. 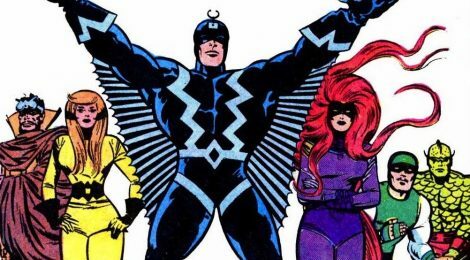 I mean, it’s unclear how many times Black Bolt has sent people to Earth to rescue Nuhumans. Has he really never encountered someone aware of the whole Inhuman society that happened? How did he find out about Nuhumans, period? Those things break down the more you think about them. If you bring SHIELD into the mix, you can build from a stronger base. Maybe the Royal Family team with Coulson/Daisy to help the Nuhumans escape from a shadowy organization that’s hunting them. You can then build Maximus’s betrayal out over the whole episode arc. It would also give you time to show just WHY Black Bolt’s rule is a good one. Because brutal caste systems aren’t usually something we’re supposed to root for. Marvel missed big with The Inhumans. On the plus side, the characters exist now in the MCU (albeit the TV branch). Even if their show is cancelled, there’s no reason they can’t appear further. In the mean time, read Saladin Ahmed and Christian Ward’s Black Bolt series.